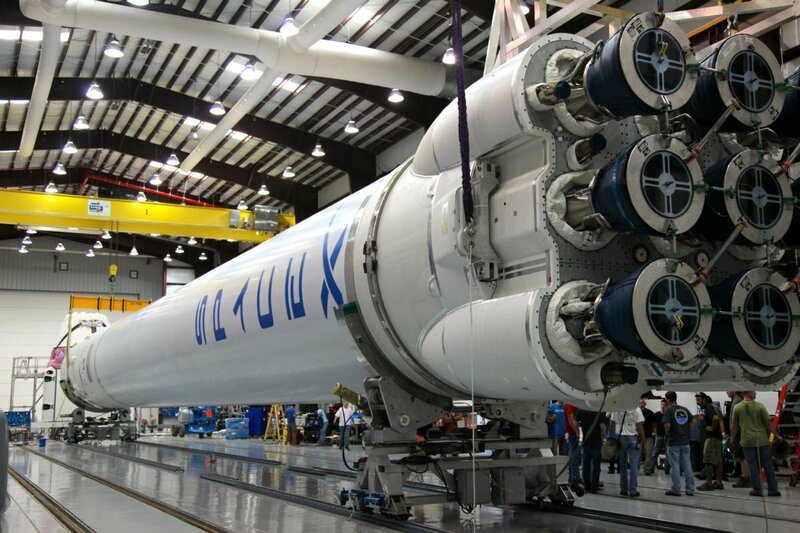 Ever since its debut in 2010, SpaceX’s workhorse rocket – the Falcon 9 – has had many major upgrades to its systems, most notably to its fuel tanks and engines. On its debut, the Falcon 9 looked much different than it does today. The most noticeable differences are that its engines were arranged in a 3×3 grid pattern, and its tanks were much shorter than those on today’s Falcon 9. It used nine Merlin 1C engines – their design borrowed and slightly modified from SpaceX’s early Falcon 1 – on the first stage, and one vacuum-optimized Merlin 1C engine on its second stage. This so-called Version 1.0 only flew 5 times, all carrying Dragon capsules or mockups of Dragon to Low Earth Orbit. In order to take more payload into orbit, which would make the Falcon 9 a much more attractive vehicle to potential customers, SpaceX created the new Version 1.1 of the Falcon 9 and began launching it in 2013. It featured numerous improvements over the v1.0 design, with the main changes being updating both stages’ engines from the older Merlin 1C to the newer, more powerful Merlin 1D, and stretching the fuel tanks on both stages. 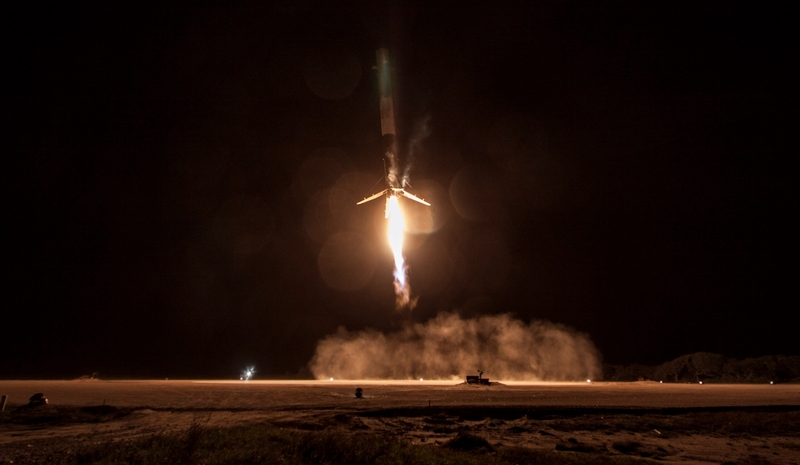 The v1.1 also brought a new possibility to the table for SpaceX – recovery and reusability. Thanks to the performance increases from the tank stretches and the engine upgrades, there was enough leftover propellant on some less-demanding missions to attempt to propulsively land the first stage in the open ocean, or later on an Autonomous Spaceport Drone Ship – which is essentially a strengthened barge. 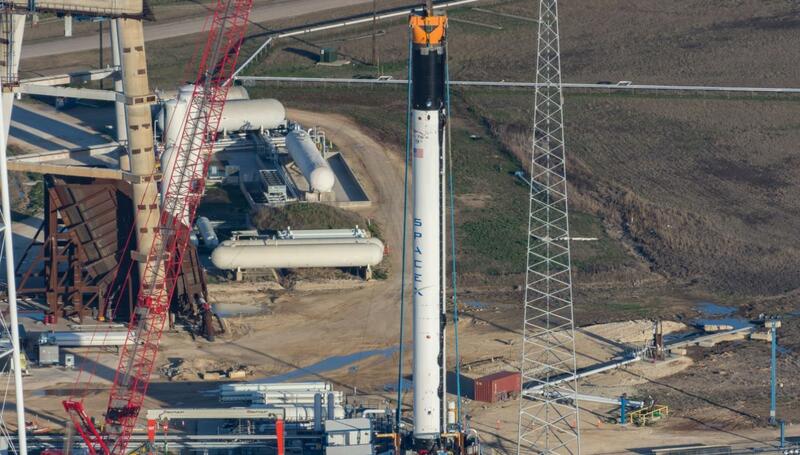 SpaceX hoped to recover the second stage of the vehicle in a similar manner to the first stage, but this has been since placed on the backburner. 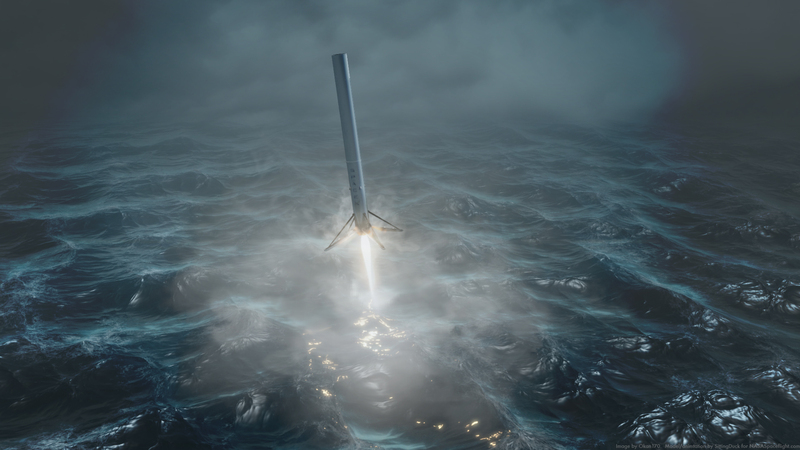 SpaceX president Gwynne Shotwell said in late 2017 that SpaceX will attempt to “land a second stage gently in the ocean” in 2018. Ms. Shotwell later said they will not be attempting reuse on the recovered stages, saying “We will not reuse the second stages, we will try to bring them home though”. The Falcon 9 v1.0 also attempted first stage recovery on its first two flights, but with a much different approach. The stages were equipped with parachutes to attempt a landing in the Atlantic Ocean. However, these attempts ended unsuccessfully, with the parachutes being torn apart due to the stages’ mass and speed. After the v1.0 recovery failures, SpaceX decided to move to propulsive landings. In order to not damage a drone ship with early test failures, the first few landing tests occurred in the open ocean, simulating a landing on a drone ship. As was expected, the first open-ocean landing test was unsuccessful, but on the second try, SpaceX managed to land the booster softly and on-target. 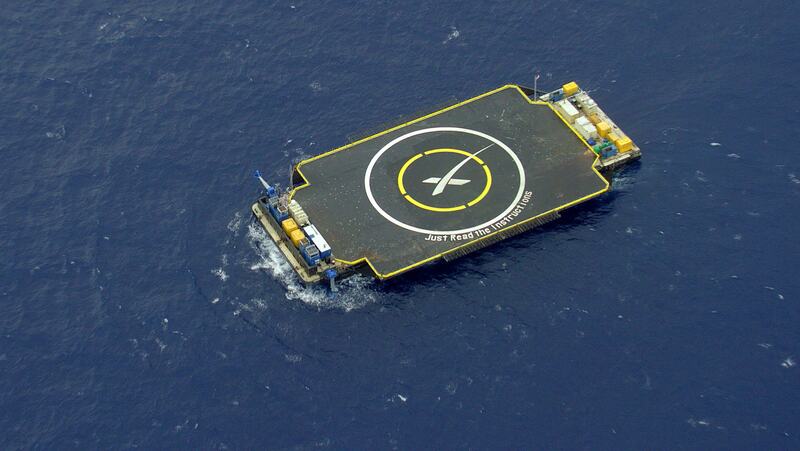 After more followup ocean landing tests, SpaceX moved on to testing landings on an actual drone ship. The first drone ship was named Just Read The Instructions, and the Port of Jacksonville was its home port. The first landing attempt on the drone ship occurred during the CRS-5 mission, but the landing was unsuccessful. The grid fins – which are extendable control surfaces on the top of the vehicle – ran out of hydraulic maneuvering fluid, which led to the loss of control of the vehicle. The booster then crashed into the drone ship. On the next landing test – during the CRS-6 mission – the throttle valve was stuck on the center engine. The stuck valve meant that the engine could not maneuver quickly, and caused the booster to sway as it came down towards the drone ship. The booster landed on the ship with considerable horizontal velocity, causing it to slide, tip over, and explode. SpaceX sent out the then brand-new drone ship Of Course I Still Love You before the CRS-7 mission with the intent of attempting a landing, but due to the Falcon 9 rocket experiencing an anomaly and disintegrating during flight, a landing was unable to be attempted. SpaceX finally landed a booster on December 21, 2015, back at Landing Zone 1 at Cape Canaveral. On April 8, 2016, they landed the first booster on Of Course I Still Love You. As of writing, SpaceX has successfully landed 23 boosters out of 28 attempts. In order to support landings on heavier and faster missions, and to allow the Falcon 9 to launch even heavier payloads, SpaceX developed the Full Thrust variant – sometimes incorrectly called “v1.2” – of the Falcon 9. Notable changes between it and v1.1 are a more stretched second stage, densified propellants and further upgraded engines. These upgrades together nearly doubled Falcon 9’s payload to LEO, and allowed first stage landings to occur on GTO missions. The Full Thrust version also featured improved landing leg and grid fin designs, and many structural improvements and weight reductions overall. The Full Thrust variant of the Falcon 9 also has had a few “block” improvements since it was first introduced in late 2015. It has 5 known blocks, and so far, 4 have flown. Blocks 1-4 were slowly implemented in 2016 and 2017, and a Block 2 (B1021) was the first to be reused. In late 2016 and early 2017, Elon Musk teased a new, final version of the Falcon 9, called Block 5. This version was to, again, have upgraded engines. Along with upgraded engines, Block 5 will have upgrades to help ease reusability and stage manufacturing. Apart from some obvious visual changes in appearance, one of the major changes is that the landing legs can be retracted by recovery crews – a major change from the earlier landing legs, which have to be removed entirely. These legs are expected to be black, matching the black carbon fiber interstage. For a recovery that’s less harmful to the vehicle, the whole first stage will be covered in a thermal protection coating to help it better survive atmospheric reentry. Also, the older aluminum grid fins will be replaced with larger titanium fins of a new shape, which will survive reentry much better than aluminum fins. The new titanium grid fins will also provide better control for the vehicle as it descends towards its landing platform. 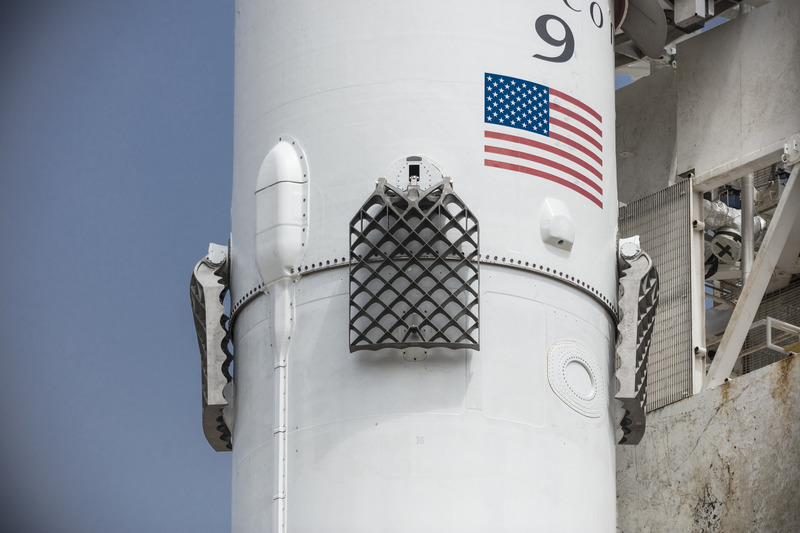 The new grid fins were tested on the Iridium NEXT-2 mission, which was on a Block 3 Falcon 9, and were used for the second time on the Falcon Heavy Demo flight side boosters. Block 5 has also been designed to meet and exceed the strict NASA crew requirements. Improvements made to meet these needs include redesigning the composite overwrapped pressure vessels (COPVs) and the turbopumps on the Merlin 1D engines. The turbopumps on the engines were redesigned after SpaceX discovered some turbopumps were cracked on flown boosters and on rigorously ground-tested engines. NASA is requiring SpaceX to fly a “frozen” configuration of the Block 5 – meaning every vehicle is built the same way – successfully for at least 7 flights. The Block 5 booster awaiting testing at McGregor – core 1046 – is currently expected to be used to launch the Bangabandhu-1 mission, currently scheduled for launch in April 2018 from SLC-40 at Cape Canaveral Air Force Station. The next Block 5 booster, core 1047, is believed to be currently under construction at SpaceX’s headquarters in Hawthorne. The booster’s engines were in McGregor for individual testing in early February. It is currently unknown what mission it will fly on, but it is expected to be finished and transported to McGregor in mid-late March.